The Glyos Transmission Web Log has updated with numerous awesome new photoshoots of figures from the July drop... and also confirmation of a July drop. The Rocks showcases a Hades Traveler plus a few really cool painted vinyl shots-- worth seeing, and most likely, worth buying. The coloration seems vaguely similar to RoboStrux. Finally, Hades Times Two shows the above figure and some gorgeous environment shots. Oh, nature! Is there anything you can't do? Its name is a damned mouthful! The Zorennor Exploration Division Crayboth Senyrith is named such, I believe, because Onell Design honcho Matt Doughty is likely a sharp tack who wants to remind me just how bad I am with naming things. Oh sure, I say I'm bad with names, but this proves it-- I am devoid of creativity. While I realize this isn't exactly a well-thought-out review, at four bucks, you really ought to get one. Well, not this one, as it's sold out. Go get another one if you can, because it's eBay or bust for the Zorennor Exploration Division Crayboth at this point. As they're cheap and trickled out slowly, these are repaints I always look forward to seeing. I hope they make more, and I really hope that Onell makes other similar squat minifigures in this exact style. When I fantasize about designing my own action figure line, they're pretty much exactly like this in terms of construction, so it's wonderful to see someone out there make a small, durable, cheap toy that's fun to mess with. In a big surprise, Onell Design packed a Nonilla Crayboth in every order from the last drop! How delightful. The figure is clear pink with glitter chunks, which you can see in the photo to the left. The figure makes (at least) the 15th release of the mold, and is pretty dang spectacular. 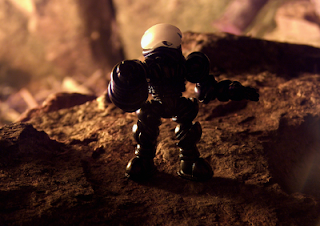 For more information on this figure, check out the official story "Stowaway" on the Glyos Transmission Web Log. It was not available for sale, but was free with orders from the last drop. At press time we do not know if any are still available.